TD Canada Trust has a special offer for students right now. 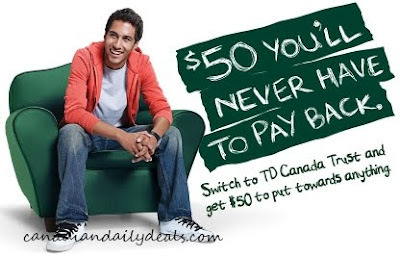 When you sign up for the TD Canada Trust Student Bundle by October 1st, you can get $50! That's $50 in your pocket for not having to do much. - Customers must be age of majority in province of residence as of October 1, 2010 to qualify for the offer. Click here for more information on the TD Canada Trust website.